There's plenty of brains in the interactive storytelling, but the gameplay can only lurch behind. A side-effect of getting older (among certain types at least) is the urge to jog. I am one such case. Yet it's never sat easily with my main interests of apocalypse and the undead. Too plodding and too dull, until now at least. Zombies, Run! 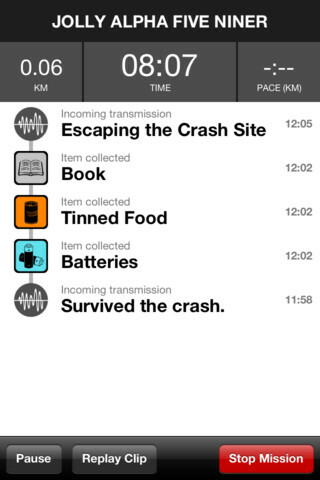 is about creating a post-outbreak scenario that lasts over weeks of jogging, a circuitous tale that unravels through audio diaries while you 'pick up' supplies to be used when you're back at base. When you're out on your run, supplies are acquired for your base. It's a good idea, and on my first couple of jogs Zombies, Run! seemed like a great execution of that idea. The narrative is presented in chunks that last anywhere from a minute to a few minutes, after which a song from your iDevice (or a specific playlist) is played, before another dose of chat begins. During the song, you'll also hear a computerised voice identifying things you've 'picked up' on the way: underwear, canned food, batteries, the usual survival staples. Occasionally, the zombies themselves break into this rhythm. Enabling Zombie Chase mode means that every so often a group of zombies will latch on to your position, quietening the music as the collective groans of the horde begin to rise. The same robot voice that ticks off supplies matter-of-factly now drones that the zombies are ten metres away, and then five metres away, while you're busting a lung in an effort to convince the app's GPS that, yes, you probably did outpace those notorious speedsters. Objectives in the game encourage you to get off your behind and excercise! Zombies, Run! can be convincing, which is largely down to the quality of its script and voice- acting. Though there are a few duff notes, and a hefty batch of melodramatic lines ("She's... right... behind you!") such stuff is the brains and potatoes of zombie fiction. What gives it life though is the cast, who deliver fear or joy or panic in their voices as well as the words. It's why, when they sign off and a bit of Bowie comes on, you set your jaw against the invisible foe all around you and get to jogging. What ruined Zombies, Run! for me though was a delay. I turned it on while leaving the house, before deciding to head back in to get a sip of water. As I pottered around in the kitchen, the recording finished and a song started up. Then the computerised voice announced that I'd picked up a first aid kit. I was standing still. The disquiet this engendered cannot be overstated. Over the coming days I played Zombies, Run! while walking, while gardening, while playing other games, and while jogging. It didn't change anything. Regardless of what I was doing, the app played on. I successfully completed a zombie chase in a supermarket queue. There's catering to different speeds of player, and then there's simple indifference to player input. The claim that Zombies, Run! is a videogame depends entirely on whether your interaction with it (ie jogging while it plays) is somehow meaningful. As a player you give it that trust without thinking. Zombies, Run! does not repay it. Illusions can be wonderful things, but as soon as you see their inner workings the magic is gone. Zombies, Run! is stuck in a kind of nether-zone between jogging-aid and game. It lacks the functionality of basic jogging apps, and is ultimately unconvincing as an interactive experience. As central and limited as that mechanic is, this is surely the most damning failure. There is much to admire in the quality of its writing and voice-acting, but the production as a whole sets far too low a bar, both for the experience it promises and the price it asks. Toothless, then, rather than a new kind of monster. What's Hot: Great voice cast and engaging storytelling. 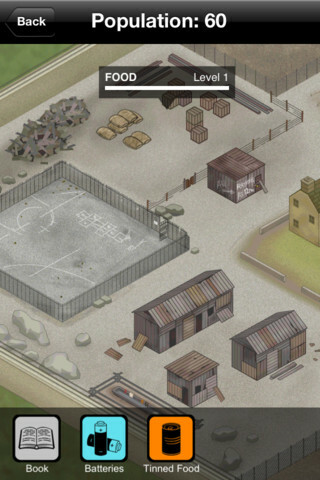 What's Not: Player input has little to no impact on collecting supplies and escaping zombies.